I have a friend named Travis who has a blog called "Travis Likes to Read." He hasn't posted in a long time, but I hope he comes back to it. I like his blog. He's very systematic in his reading. He lists the number of pages read and the time it took and such. I'm not going to do that. But, I want to post today about a book that my mom said was a classic and told me to read. 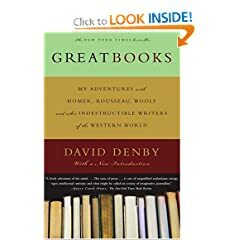 It's called Great Books and it's written by David Denby. I'm on the first chapter, but those few pages are so good that they make me want to write about things! Get this book. We'll read it together. It's about a 40-something movie critic who decides to go back to Columbia to re-take the courses they teach to Freshmen about the great books in history. The range of things that they read is staggering. There are two classes, and they're each a year long. They cover The Illiad to Rawls and Foucault. The list is heavy on people that I consider to be philosophers, but it also includes Darwin and the Bible and Malcolm X. It's a heavy list. The book promises to be about his experience as an adult who goes back and experiences these classics again with fresh eyes. At the beginning of each semester, I would stand before the books required for my courses, prolonging the moment, like a kid looking through the store window at a bicycle he knows his parents will buy for him. <...> If no one was looking, I would even smell a few of them and feel the pages - I had a thing about the physical nature of books... Reading has within it a collector's passion, the desire to possess: I would swallow the whole store. Reality never entered into this." That is exactly how I felt (feel) about books. It's not that I have too many books. It's that I don't have enough shelves and eyes and hours. I actually have some empty shelves now, and it's a weird feeling. I pared down my collection so that I wouldn't have to carry so many boxes in and out of moving trucks. Audrey knows that, when we finally have a house of our own, I'll have a library that's worthy of the name. I think she's come to grips with that because she loves me. I want that room to smell like books. Ugh, I don't want a room to smell like books! Otherwise, great post.